Always. Do. Your. Home. Work…? For many months I have been researching Yosemite National Park photo locations on Flickr, Instagram, 500px, Pinterest, Twitter, LinkedIn, The Luminous Landscape, Outdoor Photographer Locations, and how can I forget: Facebook. Then I consulted my photographer’s ephemeris, the Weather Channel, my neighbor who works at NOAA, astrological charts, astronomical charts, phases of the moon, sunspot activity reports, the Gregorian Calendar, the Hebrew Calendar, the Mayan Calendar, Dreamspell, a number of online games, Netflix, YouTube, HBO, Showtime, TV Guide, the Outdoor Channel, the Discovery Channel, Oprah, The Ansel Adams Gallery Blog, Michael Frye’s Blog, various Yosemite web cams, the Ghost of Ansel, the Yosemite Tour Bus Schedule, Bill Clinton’s speaking schedule, the Sierra Ski Report, the Central Coast surf report, literally hundreds of guidebooks, pamphlets, brochures, every hotel and motel and a few dive bars, taverns, bathroom walls and small funky convenience stores within 150 miles, searching for inspiration in Yosemite. I wanted quintessential Yosemite, but yet my own take on this hallowed place. I input all of this data into a new photographer’s analytics program that I got at Home Depot, or was it Toys ‘R’ Us? Anyway, this is an amazing program. It crunched all this data and then tracked down the almost exact location through shared camera GPS coordinates. I drove seven long hours to capture this amazing Yosemite Valley perspective that is destined to be a centerpiece of my Portfolio One. Just when I thought I was the only person who might have thought of capturing this unique vantage point, I was disappointed to find that hundreds of photographers were already there snapping away. The sound of electronic digital shutters clicking was like a thousand tiny tornadoes. At first I was dumbfounded and even sat down to cry. To think that my unique location had already been discovered. There was a lineup of photographers, shoulder to shoulder, camera bag to camera bag, stretching throughout the parking lot, down into the brush, into the woods and way up the hill as far as I could see, all facing the same direction, all with tripods interlocked. Finally after a good gnashing, howling and trembling sob, I stood up and felt a little better, resigned to make the most of the situation. I jogged down to the lineup in slow motion and imagined triumphant music and a TV crew tracking me. Esteemed photographer Ken Cravillion was there, a voice of good humor and reason. He offered me his spot between two other “photographers.” I set up my camera and took only One Shot, just as a famous muscle man from Australia has taught. “I freakin’ nailed it,” I yelled at the top of my lungs with gusto and glee. Secret Systems and Special Gear Make a Photographer…? At that moment, way up behind me in the crowd I saw my friend Jim Sabiston from New York City. “New York City,” I exclaimed when he drew near. “You must have some of the same secret systems and special gear that I do. I can tell that is what has made you an extraordinary photographer. I wonder if that is how all these amazing master professionals knew to photograph here too.” We proceeded to compare notes as I wrapped up my exposure. It turns out he looked up some of the same materials and has many of the same sources. “Golly-wiz,” I said, “We can’t let this information get out. Pretty soon all the photographs made with these secret toys, ahem, tools, will look the same.” I would not want to spoil the incredible uniqueness already developing online among people who snap photos, post regularly and read each other’s materials exclusively, rarely, if ever, reading a classic novel or setting foot in a museum. Now that I had my One Shot, I gave my spot in the lineup to Jim. I told him that I couldn’t wait to compare my photograph to his, not visually or aesthetically, but socially, to see which one would get more likes on Facebook. We are in competition because competition is, of course, the name of the game in photography, especially competition for recognition, not necessarily for quality. Quality is sort of an afterthought. What matters are “likes,” retweets, pins and reposts. Nonetheless, even though we are in competition, because it is amazing, I highly recommend checking out Jim’s photograph on his blog. It was not until I opened my photograph in Photoshop Camera Raw that I noticed that something very unusual had indeed happened after all. At first these flying objects that I could not identify in the sky were very faint. Yet, after I applied my layers, presets, plugins, knockoffs and knockouts, I found the objects were much clearer. I still am not sure what they are. They look like something from Star Wars or Star Trek, but as some people have pointed out, all three of them are the same size, even though they are each a different clarity and brightness. Something is shooting a beam off into space toward the upper left of the image. 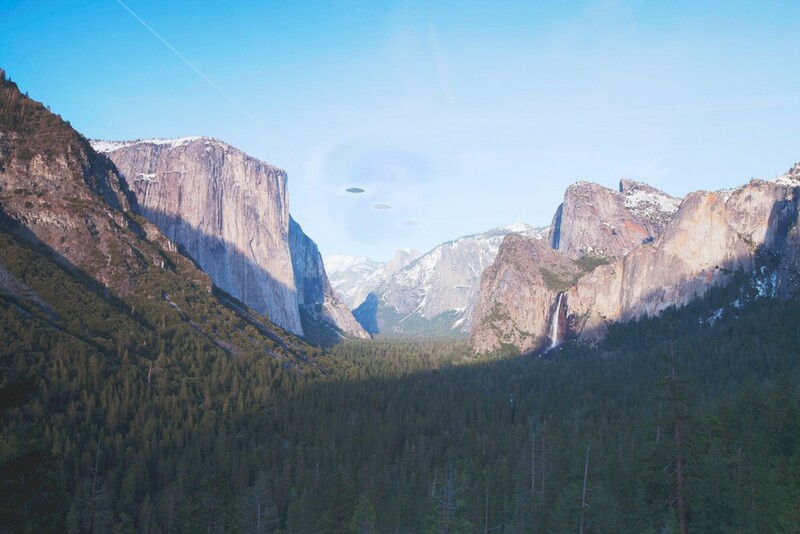 I am not sure if this has anything to do with the objects, or The Arcanum, or with Bridalveil Falls lined up with it in synchronicity on the right, but this beam is clearly there in the image and even in some other images I saw taken at the same time. If the objects are indeed flying, people have pointed out that the perspective is wrong for them to be behind one another coming toward us. I am amazed some people have even made comments like, “The sky is all messy in that spot. It looks like you Photoshopped those objects into your photograph.” Can you believe it? I was flabbergasted. I tried to explain that it might be due to the beaming in process. Skeptics. My own theory is that at the decisive moment of capture, each object was in the process of beaming in from somewhere else. This explains the differences in appearance. Also, if you look closely and squint your eyes, you too may see the objects becoming even clearer before your very eyes. They have been getting clearer in the photograph gradually all along. I am not sure how to explain this phenomenon. The objects seem to be beaming into the photograph just as they beamed into reality. I did not see the objects at the time of exposure, nor did anyone else that I noticed, though there was that one pet woodchuck that was freaking out quite a bit there in the parking lot at Tunnel View. I have asked around and as far as I know, nobody else captured these objects on their digital SD Cards or film. It remains a mystery. I suppose the case of the unidentified flying objects is one that cannot be over-thought or over-explained as is the practice with everything else in photography.